I love happy accidents. The night we stumbled upon Cocotte was a happy accident. We were headed to Yakuza for a burger, but we were stopped when we saw they were closed for a private event. We walked around the block to see what had taken over Grolla, a restaurant we enjoyed years ago, and that is when we saw Cocotte. Here is what I knew of Cocotte. Portand Food Adventures (PFA) did an evening at Cocotte. I had talked to a few that had been to Cocotte and they ranted and raved about it. Chris Angelus of PFA had told me I needed to try this place out. As we stood there checking out the menu, I told my husband that this is the place we will dine tonight. It was actually a perfect night to enjoy this small quaint space. The weather was perfect, and the windows were open giving a nice summer breeze for dinner and we were early enough to choose any table we wanted. 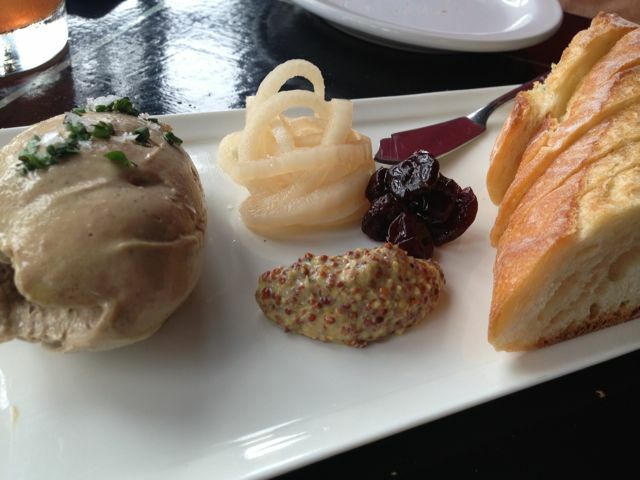 I quickly read reviews and saw that we needed to order the Chicken Liver Mousse. I won’t lie, I didn’t really want to, but the reviews were saying how awesome it was. Then we asked our server, and he agreed that we did need to order it. So we did. There was a lot of the mousse, a little bit of stone ground mustard, dried cherries and pickled onions. All this was to be combined and served with baguette. I am so glad we tried this. Adding the toppings was what made the whole thing sing. Great combo that I would have never even thought to try. I love creative chefs! Not just any butter served with this bread. Like many restaurants they start you off with bread. What other places don’t do is make a special butter for the evening. Ours had chili flakes in it. There was a lot of other ingredients and I even asked twice, but for the life of me couldn’t lock it in. That doesn’t matter, what matters is you could tell a difference, it was a great attention to detail that I loved. Also for starters we got a perfect summer salad. Corn, oregon blackberries, and lettuce all on top of whipped chevre. Again a flavor combo I would have never thought of and it was fantastic and it was some of the best of what Oregon summers have to offer. 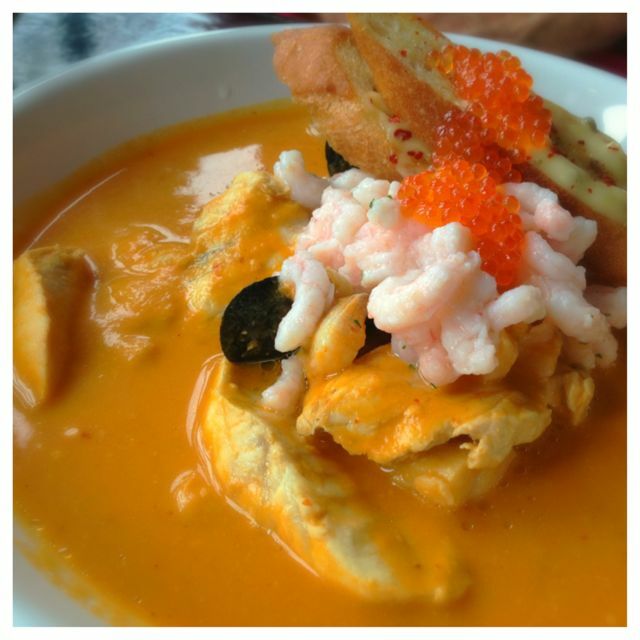 My husband ordered the Cocotte Bouillabaisse with fresh market seafood, creamy tomato saffron broth, toast, aioli, spanish trout roe. Presentation on this is a perfect indicator on how this all tasted. It came together so perfectly. The flavors were amazing. My husband has really ventured out to these kinds of dishes and he is loving them. I also love that he has been adventurous since we share everything, and I have enjoyed them too. Me on the other hand, I see Pork and I go for it. 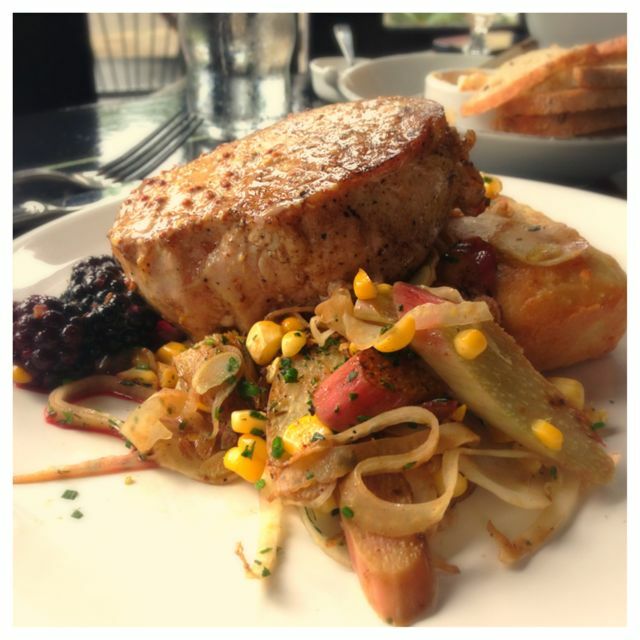 Just for the record though, I am glad I did because this is the best Pork Chop I have had in Portland. It was 8oz, which is the perfect size. It was cooked perfectly! It was juicy and very flavorful and the sides it came with were very different and I loved them. There was a type of cornbread, that was not quite as sweet as most cornbreads, yet it was the perfect texture and density to mop up all the flavors of the pork demi-glace. 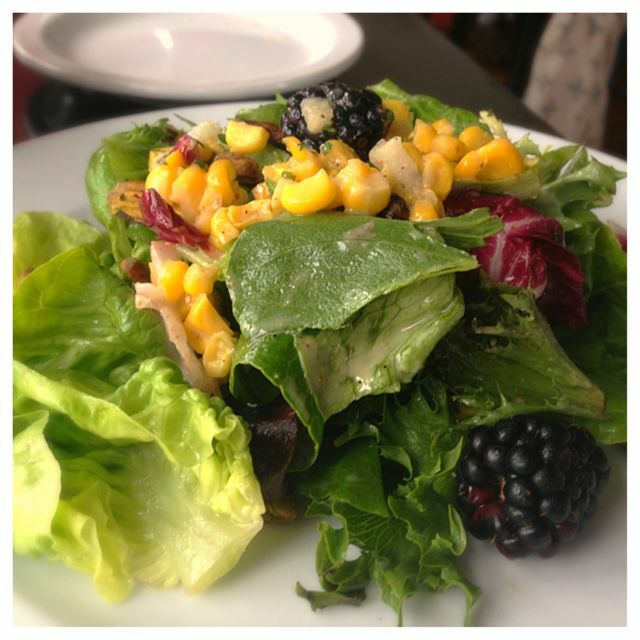 They also had berries and a succotash of corn, rhubarb & fennel. EVERYTHING was fantastic! I chose this as my Most Favorite Place to Dine in 2013. Dessert looked good, but we were stuffed and completely satisfied. Atmosphere is extremely quaint, romantic and inviting. It’s such a great space! Pricing is $15-$25, but the quality and creativity of the food reflect the price. Lots of attention to detail in these dishes. Service was above and beyond. Our guy was helpful, attentive and overall great. He made the whole experience perfect. They had great cocktails, wines and beers. 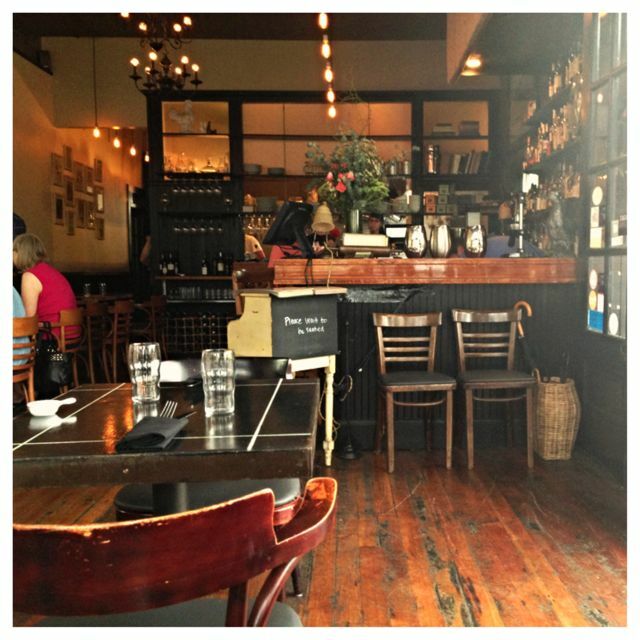 Cocotte is located on Killingsworth & 30th. I know, I’m still in denial of this one closing. I love how this all gets paid forward. Glad you enjoyed! 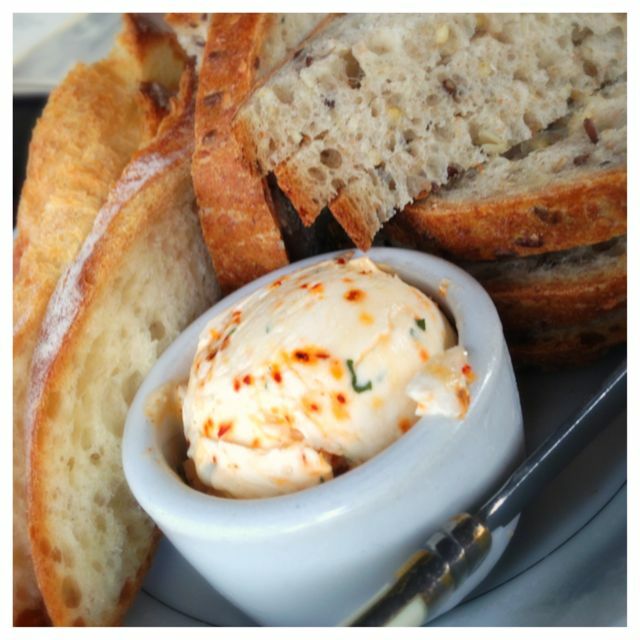 Tabatha my wife and I love hitting the restaurants you go to and this one Cocotte looks great! Next!